I was rummaging in the shed the other day, and I found one of my models built way, way back in the 1980s. I found a 1/32 P-51D Mustang that I built in 1986. 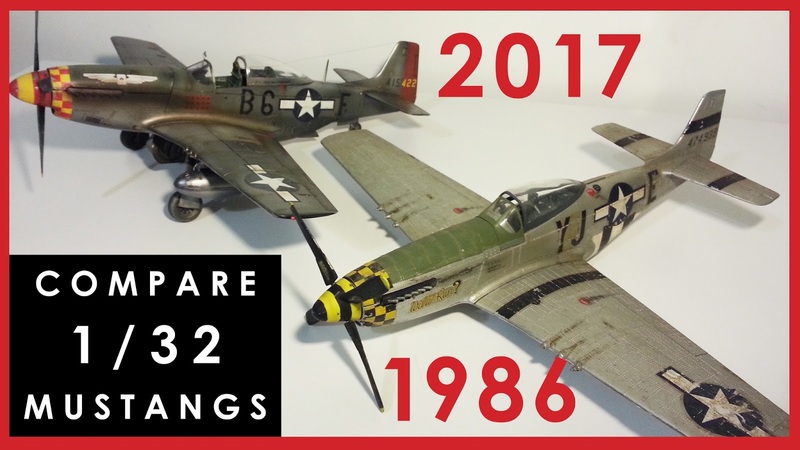 Having just completed a 1/32 Mustang a few weeks ago, I thought it might be interesting to compare the two and see how far I, and the hobby, have come in 31 years! I've kept most of the models I built when I was a kid and a teenager, but with 20-30 years of storage and moving house most are in a pretty sorry state. Combine this with the pretty average model building skills I brought to them at the time, and I'm not really in the mood to share much of them! But it is very satisfying for anyone to see how far they have come. Looking at these two models side by side, I'm struck by what a massive difference an airbrush and some weathering skills make. Really, if all you ever improve is getting yourself an airbrush and learning how to use it, and some basic weathering techniques (may I humbly suggest starting with this video here), you will be streets ahead of where you started from. The video is just a bit of fun, it's not terribly deep or philosophical. That said, I do recommend you try to keep your old model builds, and that way if you ever lose your mojo and think you're not terribly good, all it will take is a quick look at how far you have come to re-motivate yourself! Any suggestions on improving my videos or blog?